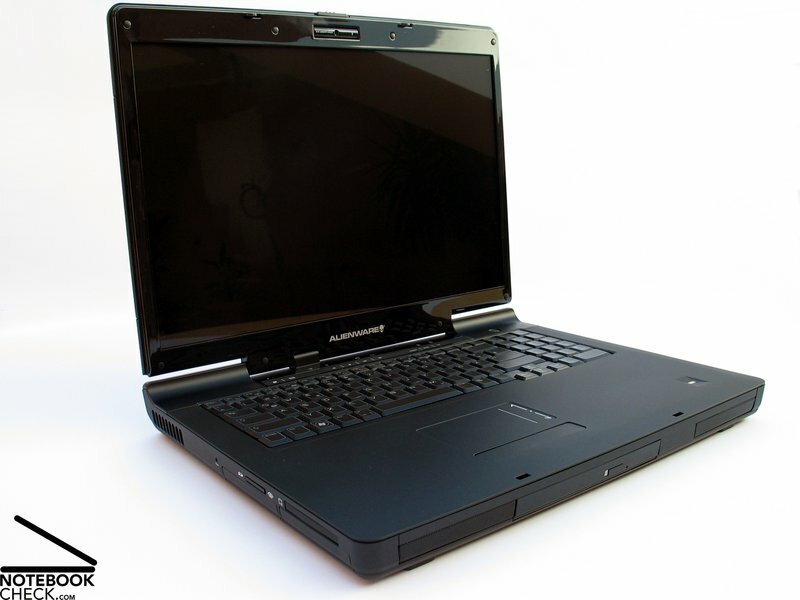 The Alienware M17 represents besides the already tested m17x and the Alienware m15x the third series from the creator specialized in gaming machines. The most significant difference to the other models is, however, the choice of the graphic card manufacturer ATI, in opposition to the other Nvidia based systems. 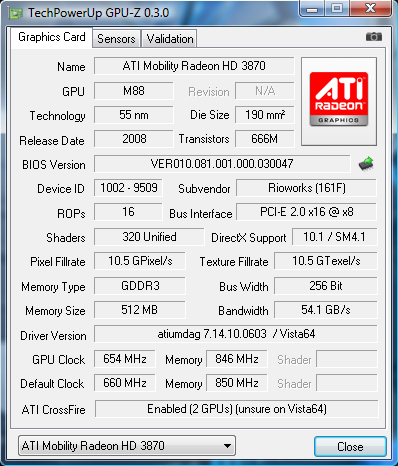 In the M17, two currently most efficient mobile graphic cards from ATI are used, both being a Mobility Radeon 3870HD graphic card in a crossfire combination, the alternative to Nvidia's SLI technology, so to say. 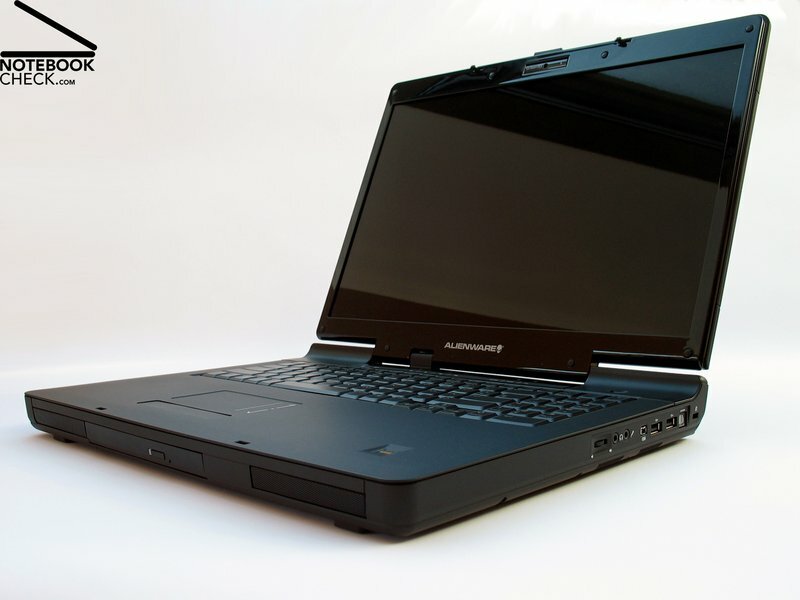 In consideration of its case, as well as the available hardware components, the M17 from Alienware correlates to the Devil 8000 XTX of the German retailer Deviltech or also the mySN CXG7 from Schenker Notebooks. All of these notebooks are based on the same 17 inch barebone from OCZ. 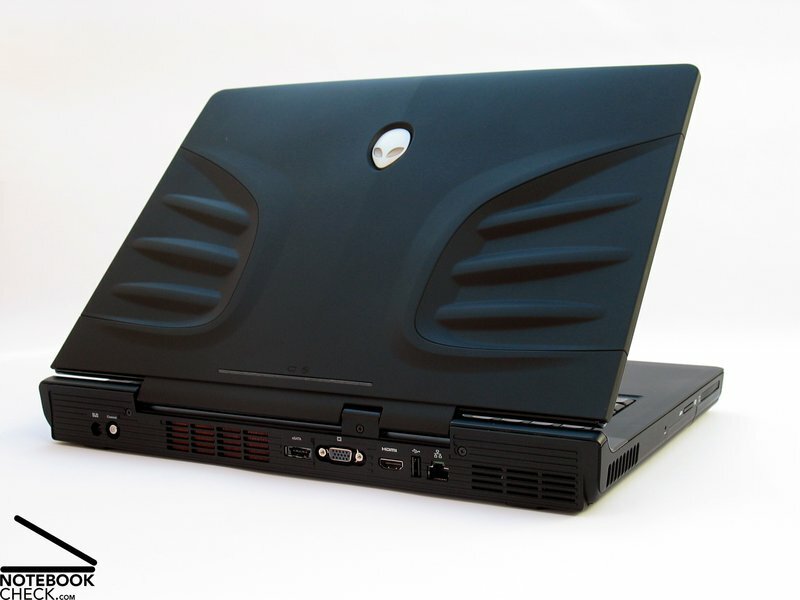 Actually there is only one true outfit for the Alienware notebook, this being the so-called "Skullcap Design". 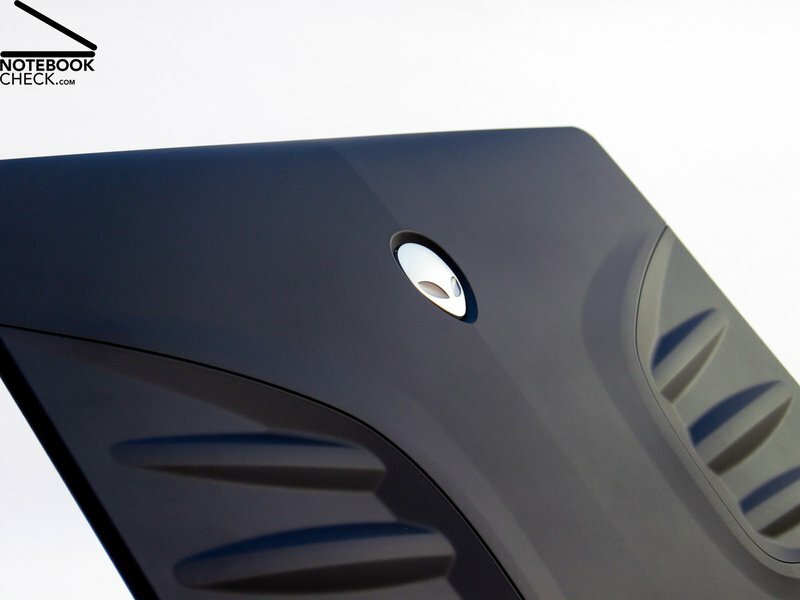 We're talking about a very massive display lid with symmetrical lined up "gills", which might just remind of a ribcage. No other notebook comes close to the recognition factor with this look. 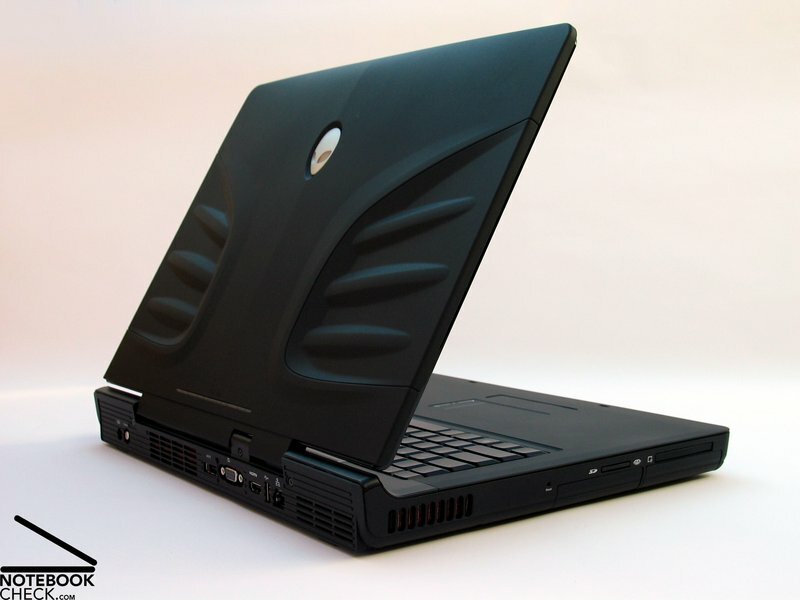 Alternately, Alienware offers the considerably plainer "Ripley Case Design", in which merely the middle light edge as well as the central illuminated Alien logo stays unchanged and the rest of the display is kept unadorned. 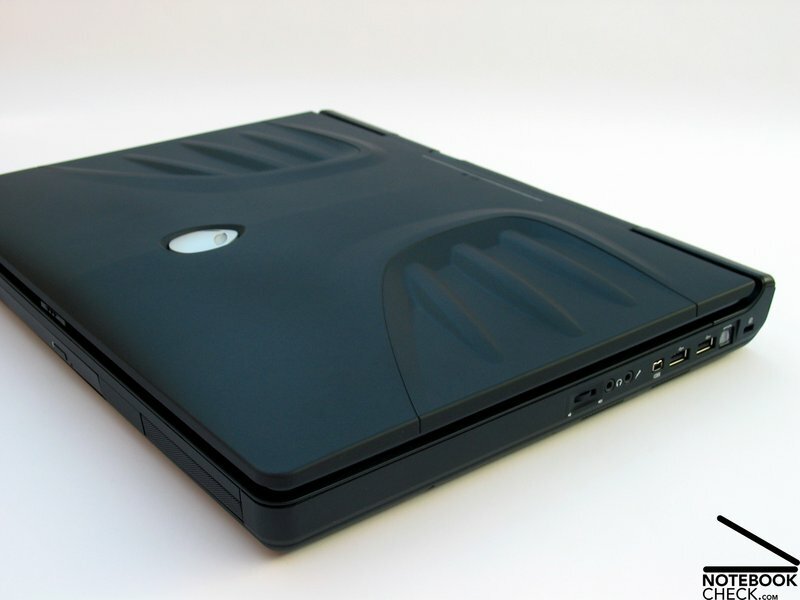 Both of these design aspects distinguish the Alienware device from some other otherwise similarly built notebooks. 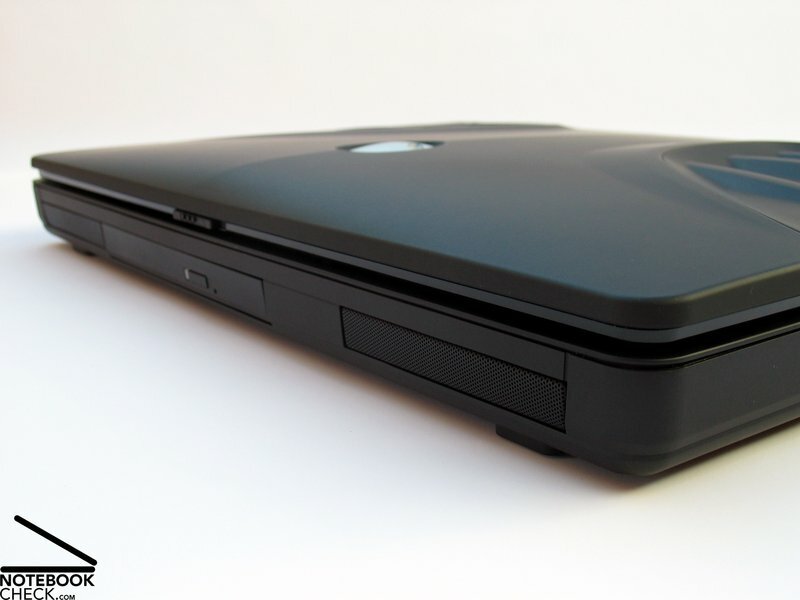 Alienware also kept the coloration and finish of their devices in mind. The entire case is covered in a so-called "Stealth-Black". This label refers to the velvet-like matt surface which is as good as resistant against particularly unattractive usage signs, such as fingerprints. In consideration of the current high-gloss affinity of many multimedia devices, this is very well worth a word of praise. The strong base unit as well as the display lid itself is extremely insensitive to pressure. While the possibility of the base unit deforming during lifting it on the front edge tends toward zero, the display shows itself in this exercise as exceptionally susceptible. Creaking sounds weren't omitted here either, which can already be elicited when opening the screen. We weren't quite happy with the chosen hinge type. In fact, the centrally placed flip top shows a very largely dimensioned hinge but it allows an obvious luffing of the display. Admittedly, this is fortunately not further distressing when the notebook is used practically completely stationary, unless of course the book is being used on a somewhat shaky desk. In short, the reference values of the case: Width: 396 millimeters, depth: 300 millimeters, height of the base unit: 32 millimeters, maximum total height: 57 millimeters, total weight: 4480 grams, power supply: 1430 grams, total travel weight: 5910 grams. 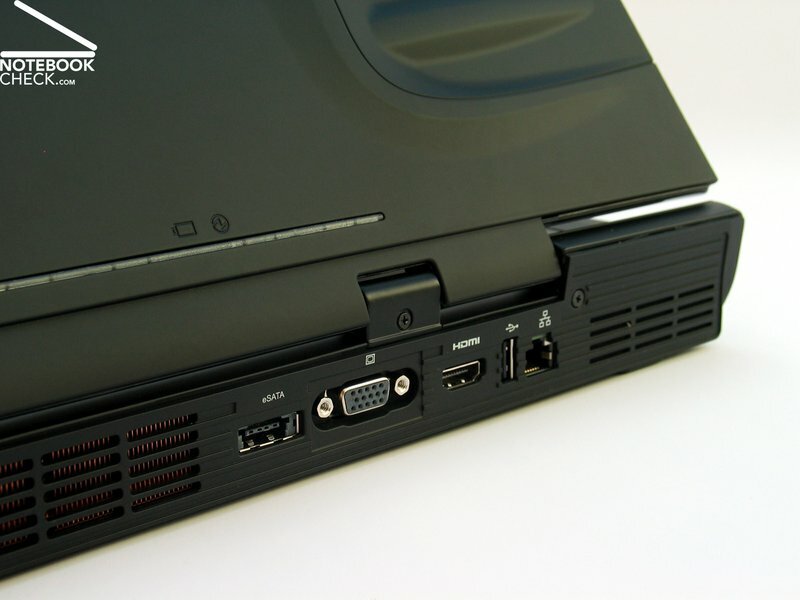 A total of three USB 2.0 ports, a combined USB/eSATA port, an analog monitor VGA-out, a HDMI port, firewire 1394a, and an antenna connection for the configuration with an integrated TV tuner are offered. "Audio" is also written with a capital A. Besides the standard socket for a microphone and headphone, the M17 also has an optical TOSlink digital-out. With this, a 5.1 signal can be lead to your hi-fi system. 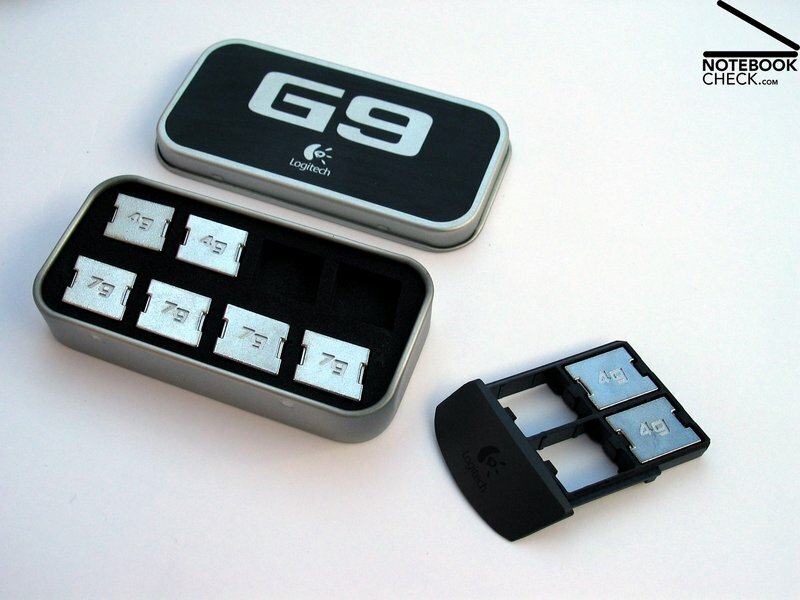 This is supposed to make gaming pleasure with the notebook perfect. 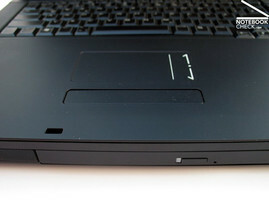 The optical drive is accessible over the front edge of the case. 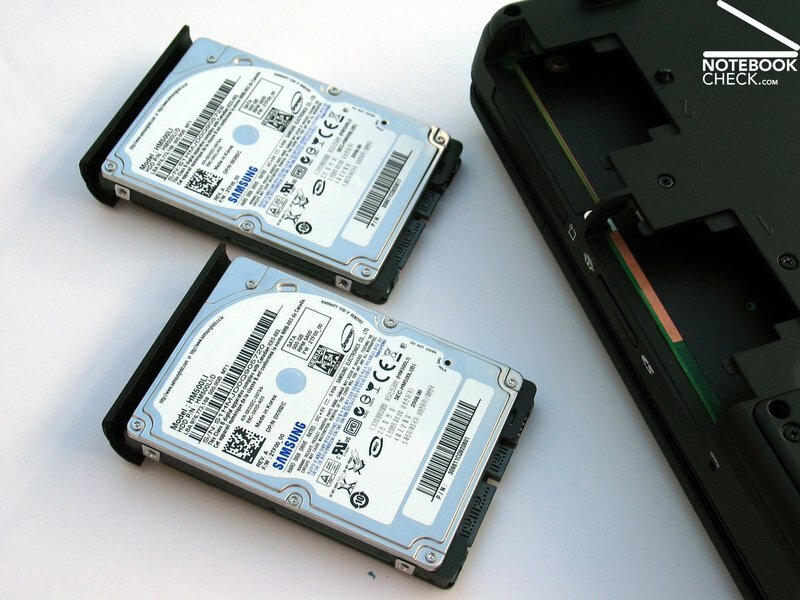 A classical DVD/RW drive or alternately a Blu-ray drive can be inserted. 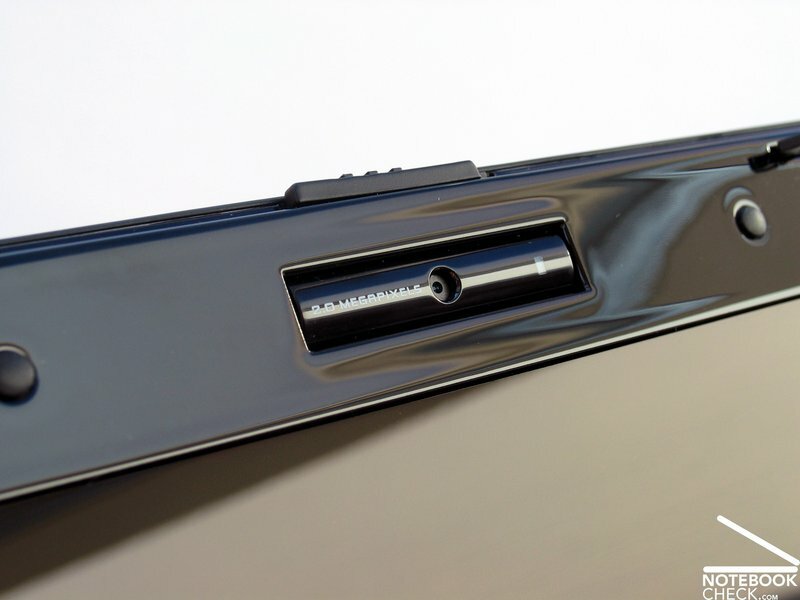 The presented ExpressCard slot and the SD cardreader (7in1) are found on the left side front area of the case. The maintenance covers for the two hard disk slots are found right under these and both were occupied in our test sample. 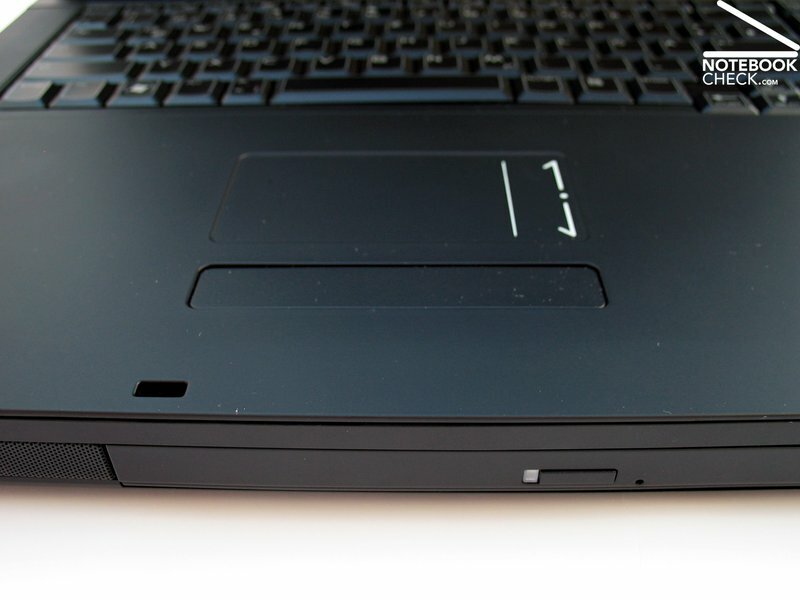 Despite the generous space proportions on the barebone, the ports were concentrated mostly on the right side edge tending towards the rear area and on the back side of the notebook. Particularly the connections on the back aren't optimally visible with that, but they are more the permanently occupied sockets here. At use, the user profits from the vacant work space left and right of the notebook, even with extensive port occupation. Lefties and righties are practically treated equally, too. 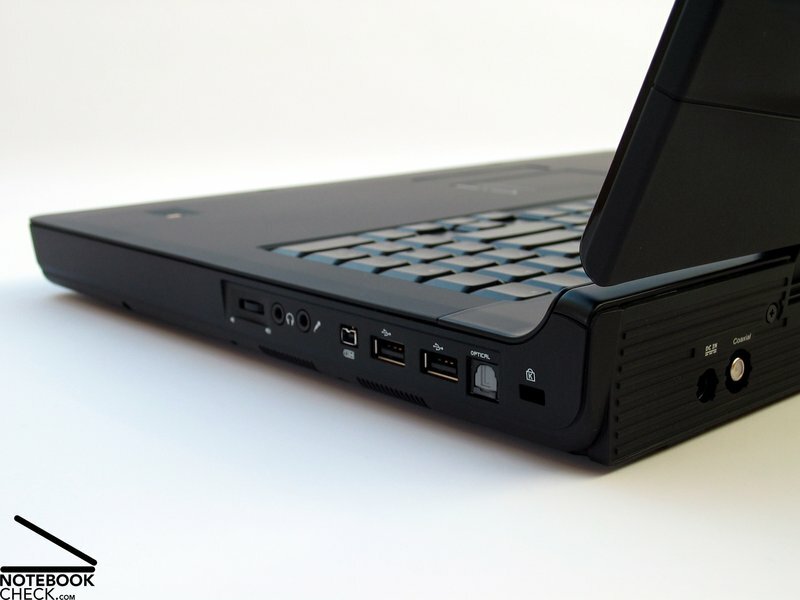 The Alienware M17 also has a gigabit network connection (Marvell Yukon 88E8055) and a wireless LAN from Intel (WiFi 5300 a/b/g Draft-N) with a transmission rate of up to 450 Mbps. On board for wireless communication with diverse peripheral equipment is also a Bluetooth 2.1. You have to pay through your nose if you aren't content with the one year basic warranty. It's 183.00 Euros for two years and even 275.00 for the three year AlienCare Protection package. 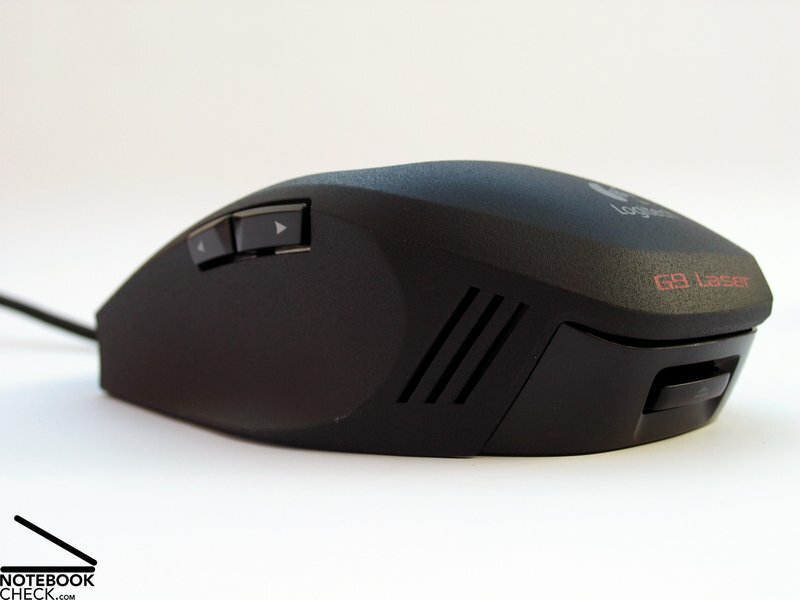 The best system is worth nothing without first class input devices, especially a gaming suitable mouse. Alienware knows this, too. For this reason, a gaming bundle is offered optionally for the M17. 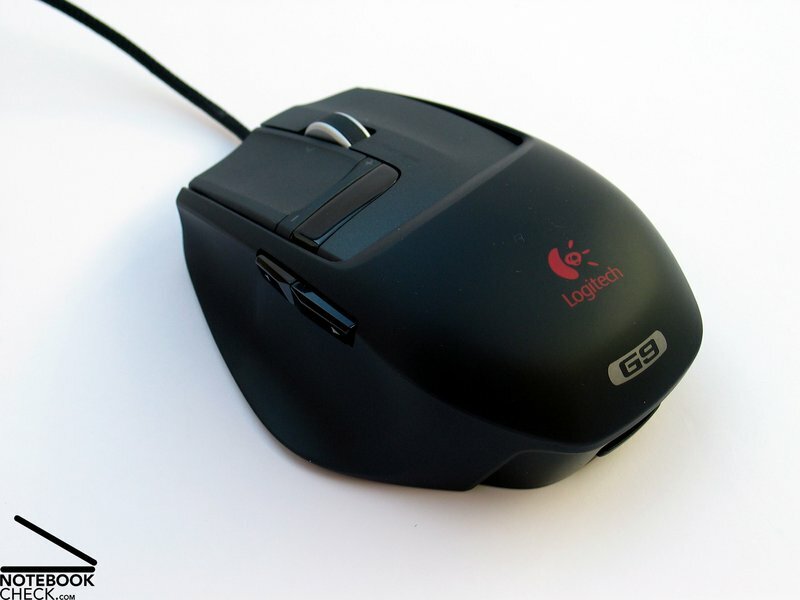 It contains a Logitech G9 laser mouse and a Logitech Precision PC gaming headset. At a retail price of 77.00 Euros it can almost be called low-priced. The current street prices only even start at about this total price. 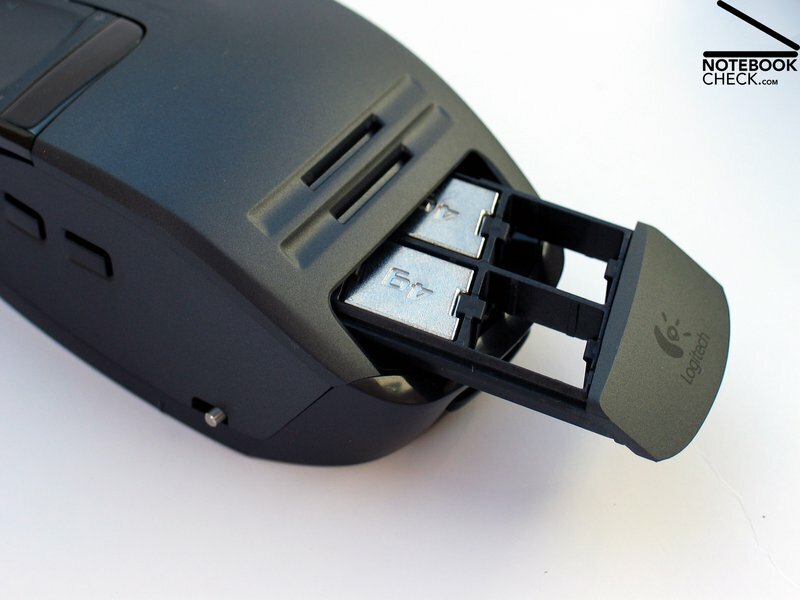 Gamers probably don't have to be indoctrinated here but for all lateral entrants the following should be said: Even the best Ping is no good if you don't possess an adequate mouse. 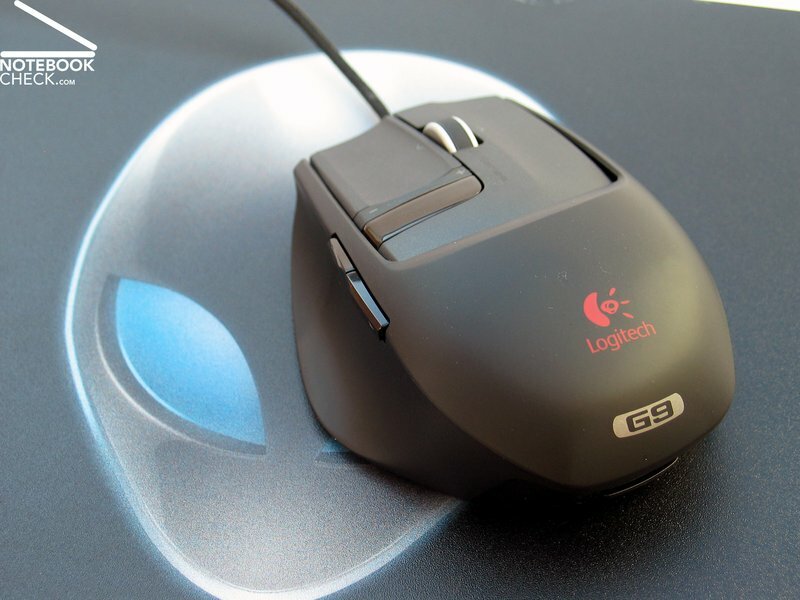 The Logitech G9 offers a good basis. With a resolution of up to 3200 dpi and a laser scanning almost unsusceptible to surfaces, the G9 feels at home on pads and table veneers. 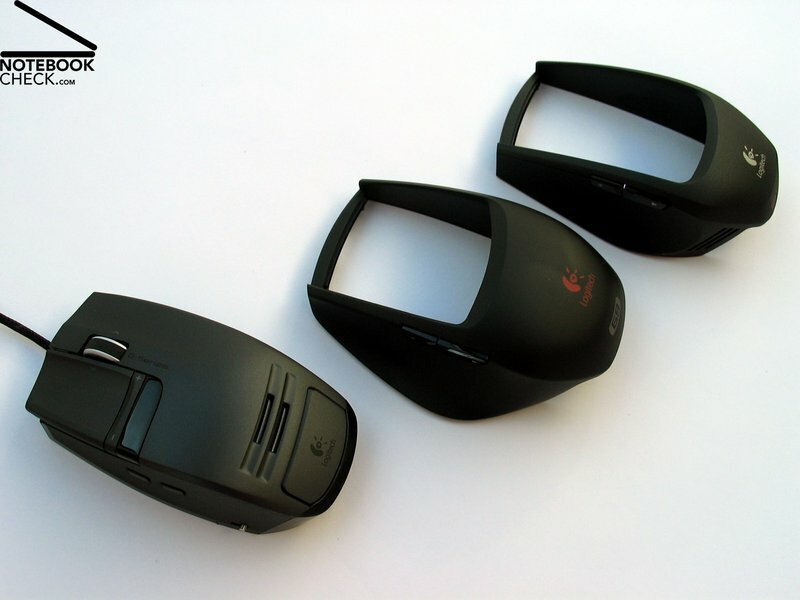 The two changeable covers with a different shape provide an optimal fitting for the contour of your hand. But that's not being enough. The low dead weight of the mouse can be adjusted to your individual needs with special weights. Even a distribution of load is possible with these. The most important feature of the Logitech G9 is the adjustable sensitivity of 200 up to 3200 dpi in three levels during use. Highest precision can be triggered, i.e. in the sniper mode, with a push of a button. That the keyboard of a full-blooded gaming notebook doesn't necessarily have to have a supreme suitability for typing seems to be obvious. But for most current games you are dependent on the keyboard to a certain extent – unless you prefer to make entries over a gamepad/joypad. 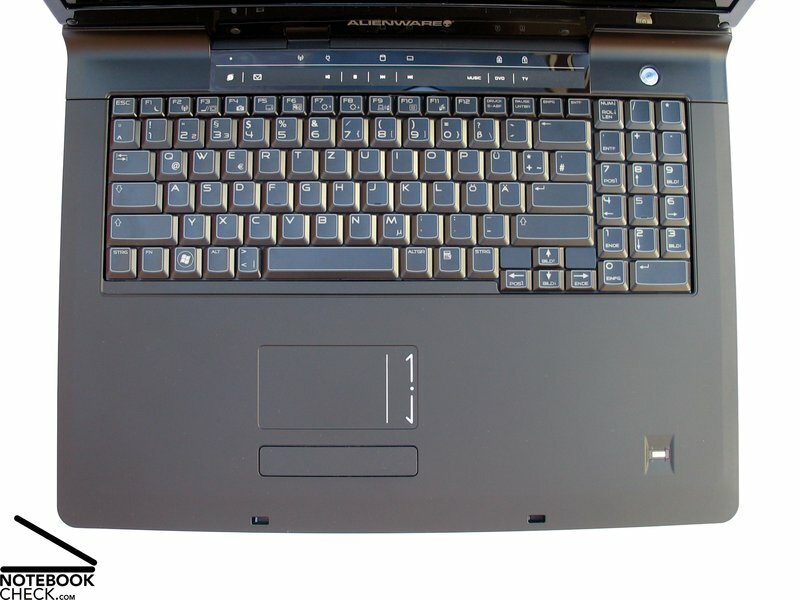 Particularly because the keyboard is placed fairly far in the back of the base unit and the comparatively elevated height with a sharp-edged finish in the front of the same is barely typing-friendly. Of course writing texts is very well possible, but it's not really going to prove to be a pleasure. The typing-feeling turns out quite sufficient and can be described as being minimally jerky due to the palpable pressure point. The stroke depth turns out average. We were pleasantly surprised from the agreeably quiet clicking noise level at typing. For a surcharge of 23.00 Euros you can also acquire the keyboard with a background light, which can be set individually as already in the m17x. This makes the notebook especially in darker surroundings to an eye catcher. Unfortunately, the keyboard lighting in our test sample didn't turn out quite as consistent as in the case of the m17x. The touchpad has, on the one side, a good size and on the other it showed itself as very gliding-eager, although the pad is furnished with the same "Stealth Black" surface as the rest of the case. 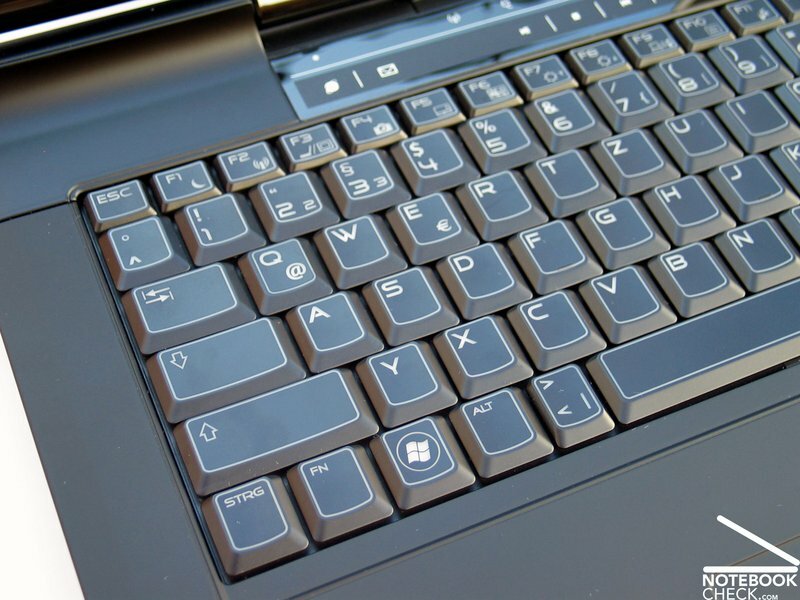 The corresponding key bar has to put away critique. It has a very big dead zone in its center, making it sometimes hard to use. Fn+F5 remedies this by simply deactivating the touchpad. 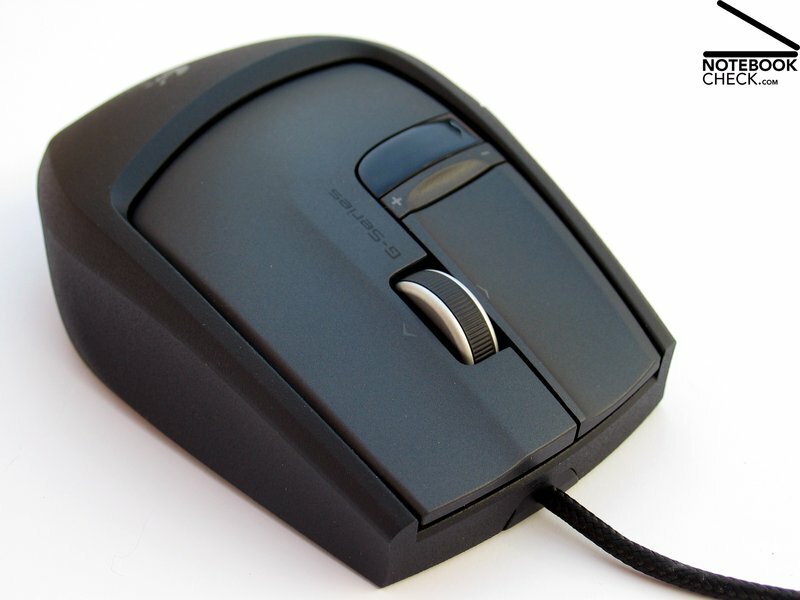 It is advisable to use an external mouse in any case, also because of the large desktop surface of 1920x1200 pixels. 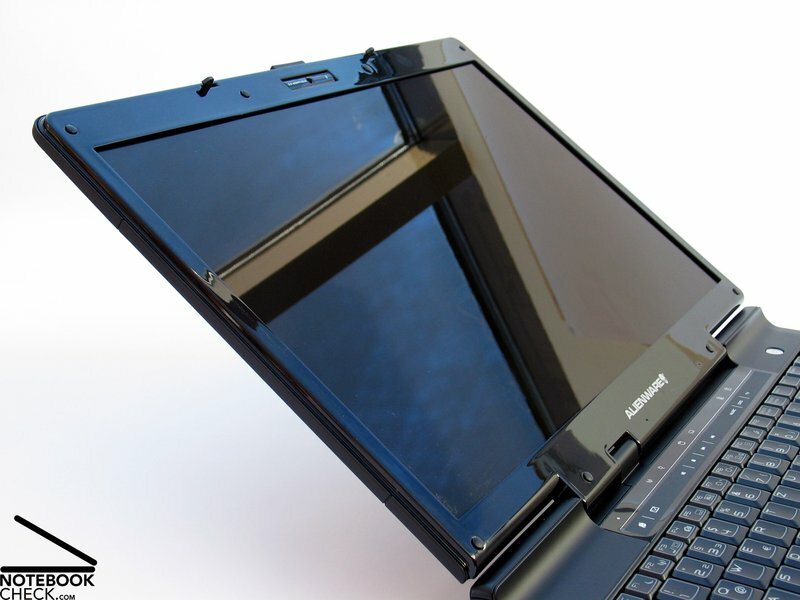 There are two screens available for the Alienware M17: A WXGA+ display with a resolution of 1440x900 pixels or a WUXGA screen with 1920x1200 pixels. The latter was used in our test sample and distinguished itself through its overview on the display. Due to the efficient hardware, the resolution can be conveyed in many games. The applied benchmark tests confirmed this. In the scope of our brightness measurements with the Mavo monitor from the firm Gossen, we were able to determine a maximal brightness of 216 cd/m2 in the middle lower display area on the WUXGA screen. The rather weak brightness distribution also became obvious as the maximum brightness of the display fell off to 142.7 cd/m2 in the left upper corner area. The screen received a good mark for its image display, though. The subjective color presentation, as well as the maximal possible contrast of up to 516:1 leaves nothing to be desired. 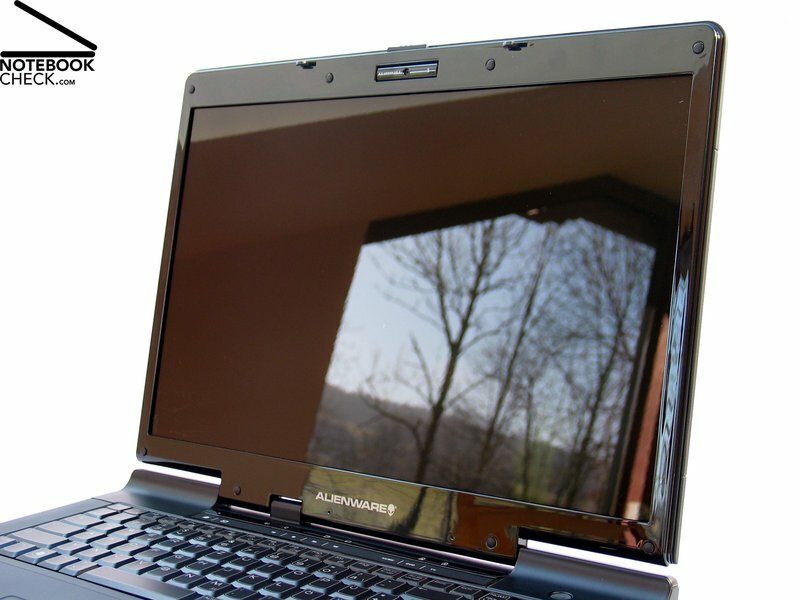 The reflective glare-type surface contributes to the color vibrancy but also causes unpleasant reflections in adverse light conditions, especially when slanting the viewing angle. The offered stable viewing angles are very generous in the horizontal area and can be described as sufficient in the vertical area. 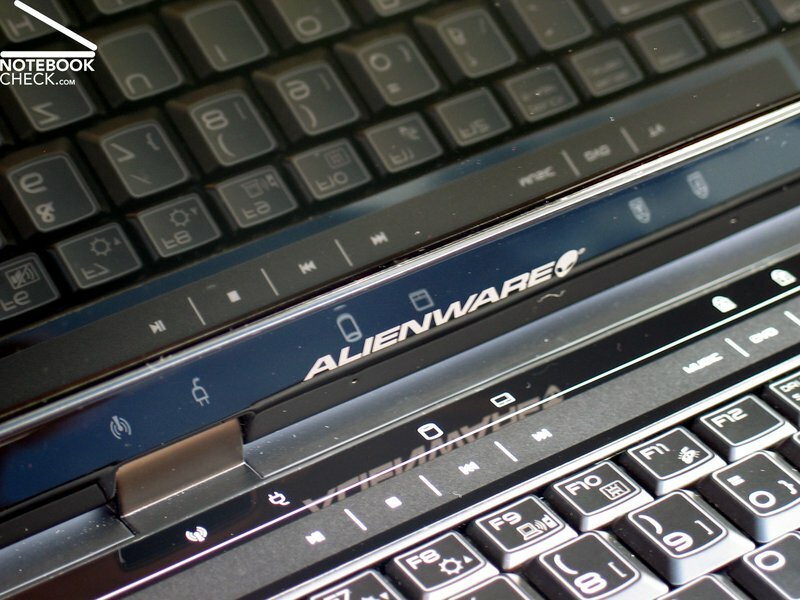 The Alienware draws on abundant resources, so to say, when it's about the available hardware. In regards of the processors, practically the whole efficient Intel range is applicable in the device. This begins with the P8400 CPU with 2.26GHz and 3MB L2 cache, which is available for a rather comparably low-price but doesn't really go along with the meaning of the "high performance" idea. In order to especially score where money doesn't necessarily count, Alienware, of course, offers the currently most efficient mobile CPUs from Intel for the M17. These being the Core 2 Extreme X9100 CPU with 3.06 GHz and 6MB L2 cache or the brand new Intel Core 2 Quad Q9100 or rather the Core 2 Extreme QX9300 chip with 2.53 GHz and an immense 12MB L2 cache. We could determine in our test with the main focus on Quad Core CPUs that at the moment the clocking of the CPUs is mainly responsible for an increased efficiency at gaming or in many applications. It has to be counted with that upcoming programs and games are going to use even more the resources of a multi core CPU and that the future belongs to Quad (and higher) cores. In the scope of these tests, the QX9300 CPU could primarily score though it's over-clocking possibility. The chip ran stably with up to 2.93 GHz and banished all of the other chips in regards of performance back into line. The four core is not exactly cheap, you have to cough up a total of 1,101.00 Euros for this chip at Alienware – respect! That the Alienware computers practically claim the top position in various benchmark tests is something which has to be acknowledged in the meantime, if it's liked or not. The M17 continues this trend without compromise: The 8160 points in the PC Mark 2005 benchmark test provides for a new top mark of those from us tested samples. Even if it's not quite a pushover for the Alienware M17, the Cinebench R10 benchmark results provide for a commotion. It's not as much the graphic as the efficient quad core CPU that practically cold shoulders dual core processors in the Rendering Test optimized for multi cores. Due to the 64 Bit operating system our test sample was able to completely use the built in 4 GB RAM. Alienware has to be given credit for their explicit reference to this 64 Bit problem during the configuration of the notebook. 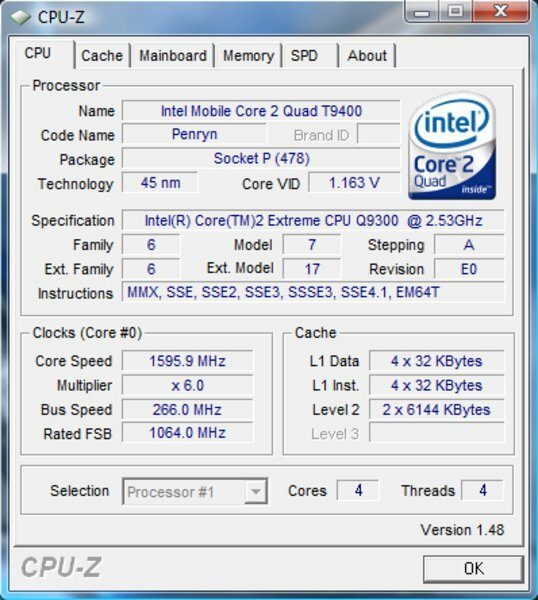 Fast DDR3 PC8500F chips with 1066MHz on two 2GB bars in a dual channel operation were applied. According to various internet reports 8GB RAM should be possible, even if Alienware doesn't officially confirm this. 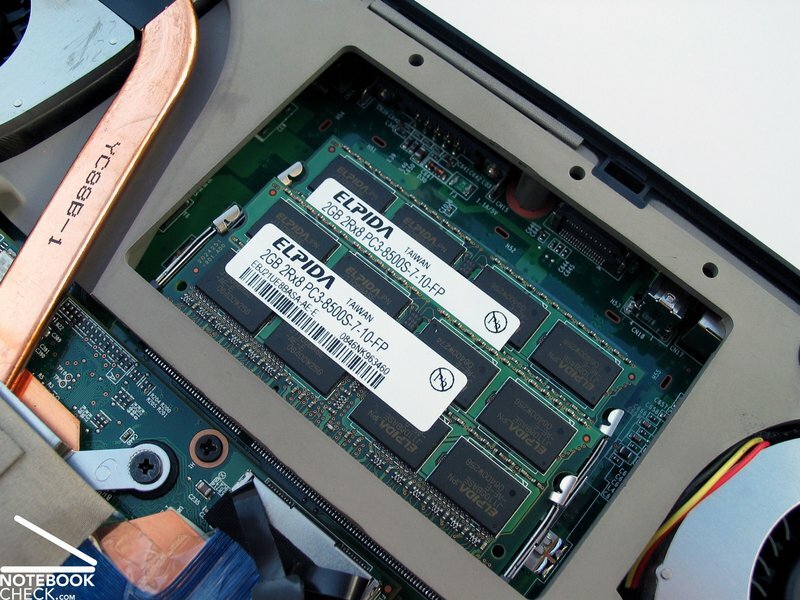 The equipment should also leave nothing to be desired in regards of mass memory. Alienware offers two drives á 500GB gross capacity, either as a 5400 rpm model or in the faster 7200 rpm version. With that we are talking about a total volume of one terabyte memory. 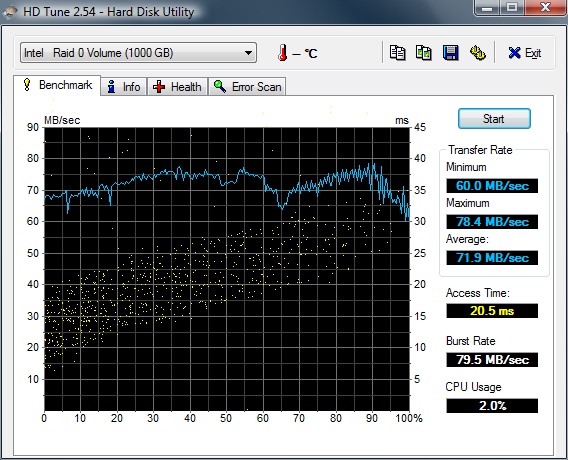 Both hard disks from Samsung (HM500LI, 5400 rpm) in a Raid 0 configuration reached a very good transmission rate of an above average access time of 20.5 milliseconds in the HDTune benchmark test. Even if it's not representative for the performance of up-to-date games, the 3D benchmark test does make a comparison of other systems possible, in order to categorize the approximate efficiency. 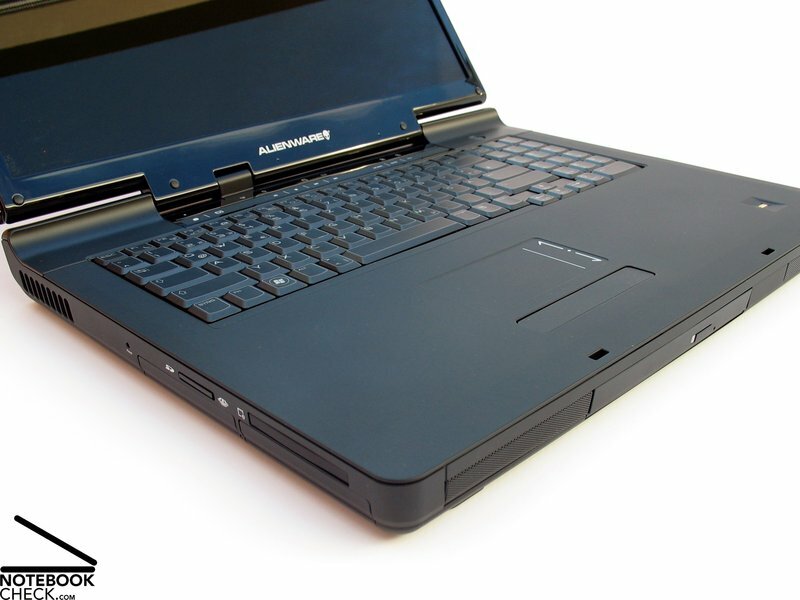 Alienware also doesn't leave a doubt about its inclination: The M17 puts itself here on top of comparable illustrious gaming notebooks with a result of 13699 points in the 3D Mark 2006, as well. It really gets interesting in the practical gaming test, though, where it's not about points but rather a sufficient frame rate, which decides about the playability in the end. For the tests we used, unless noted otherwise, the preinstalled graphic driver 7.14.10.0603/Vista64 from Alienware. Besides that, an updated modded drive (DH Mobility Modder) – 7.14.10.0636/Vista64 was partly used for comparison reasons. According to various reports, the performance of the crossfire solution from ATI is strongly dependent on the applied drivers, fitting to the individual application. In view of the equipment of the notebook as well as the good results in the 3D Mark benchmark test, we decided in favor of an equivalent resolution for the ego shooter, which is known as especially resource demanding. 1024x768 pixels was chosen, at high details. We were disappointed in the run of the demos built in to the game (GPU benchmark, CPU benchmark), though. Graphic errors impaired the image and the performance of approx. 30 Fps couldn't convince, either. Additionally, there was an obvious stuttering. These might just have been the so-called "micro-studders" which turn up in the area of 30 Fps in SLI and Crossfire graphic solutions. In medium detail settings the noticed results lied around 36-37 Fps in the benchmark test. The graphic errors remained, though. Playing the demo version in high details didn't really knock off our socks, either, with a rate of approx. 20 – 30 Fps. In medium details an only restrained satisfactory result was reached with 32 – 40 Fps, as well. A retesting with the modified graphic drivers (7.14.10.0636/Vista64) only brought a slight improvement of the noted values of about 5%. 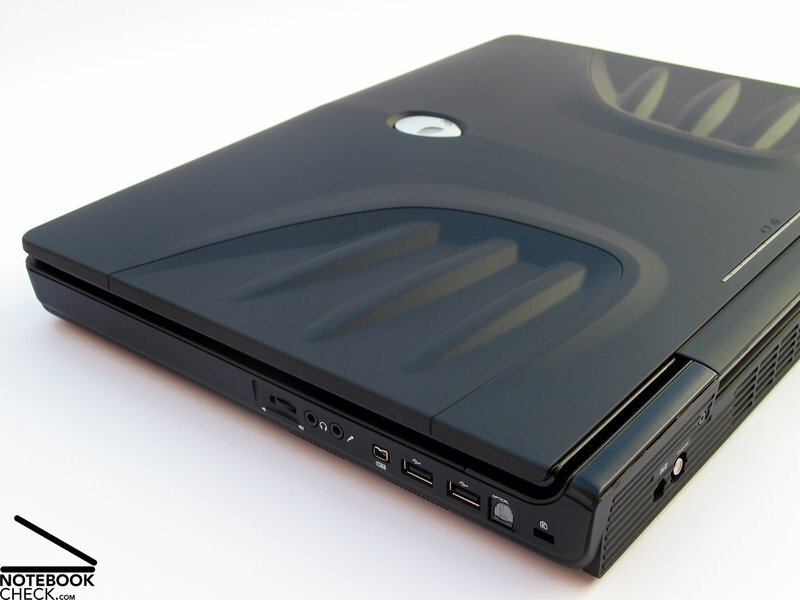 The Alienware M17 didn't have any problems with the popular multiplayer-shooter "Call of Duty". The Fps level remained nearly always over 80 Fps at a setting of 1024x768 pixels and even at a resolution of 1920x1200 pixels a still very playable frame rate of approx. 40 – 60 Fps was reached. 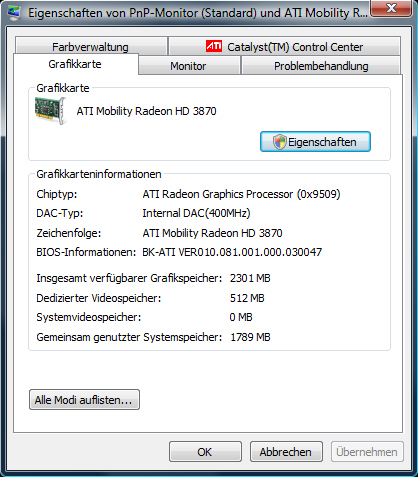 It is possible to select the support of a second graphic card in the settings of the game. Our benchmarks showed that this option barely brings a noteworthy performance advantage or disadvantage. The test system revealed consistently good results in the test with the real time strategy game "World in Conflict". Even at high details (DirectX 10) and very high details a still playable performance could be noted with the support of the integrated benchmark tests. Even in a very detailed graphic, a frame rate of 45 – 60 fps was noted in the practical multiplayer test on the map Seaside in a match 3 vs. 3 (settings 1920x1200, high details). Supreme Commander – Forged Alliance belongs to the same genre, even if with a completely different gaming concept. We drew on the system integrated benchmark test to classify the test system here, as well. The result was impressive. Even at a maximum resolution of 1920x1200 pixels and high graphic details, the benchmark test delivered well average frame rates of 46.4 Fps. This was confirmed in the practical test, where in the multiplayer match 3 vs. 3 on a 20x20 km map about 30 – 50 Fps with the same settings was observed. Brand new on the gaming market is the successor of the horror shooter "F.E.A.R". If there was a performance test integrated in the first part, then you have to obviously do without it now - at least in the current demo version. This is why we noted the frame rates while insinuating the first levels, in order to draw conclusions on the performance of the notebook. On the basis of the Fps development you can recognize that with a resolution of 1920x1200 pixels a still very good performance of over 60 Fps could be reached, even in high details. The limits of playability is reached with a resolution of 1920x1200 pixels, though, the frame rates only staying slightly over the 30 Fps mark. While the most current line of the successful GTA series has already been available for consoles for a longer period of time, it now can also be ordered for the PC. The system requirements on the package disclose the following: Intel Core 2 Duo 1.8 GHz, 256 MB Nvidia 7900 or 256MB ATI X1900 – desktop hardware, it shall be understood. With this, Rockstar Games makes one thing clear: For this game, it should be a graphic card from the performance category I of our comparison of mobile graphic cards, in order to play the game with correlating image quality and speed. As a point of reference: This means for the mobility field everything above Geforce 7950 GTX (8800M GTX, 9800 GT/GTX, ATI 4870 or various SLI and crossfire configurations). For the notebook gaming community the possibilities become scarce. Practically only full-blooded gaming bolides come in question with that. Fortunately, the Alienware M17 belongs to this category, giving us a few thrilling hours in Liberty City. You should give up the idea of taking the highest available resolution without compromises. The first benchmark test at a resolution of 1024x768 already reveals the truth: An average of 41.38 Fps in medium details. This didn't lead to a noteworthy improvement in the practical test. An additional increase of performance is possible through a further reset of settings in consideration of viewing distance, detail level and vehicle density. 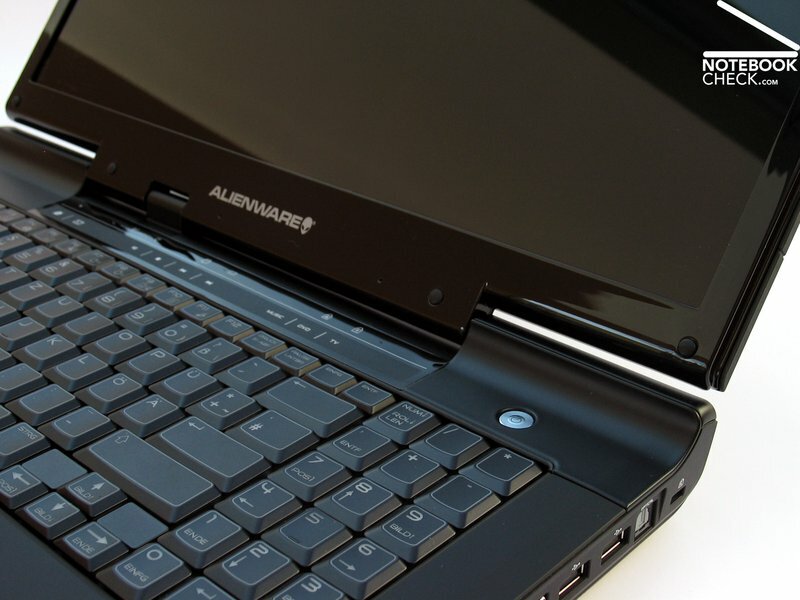 The Alienware M17 can be described as a very quiet ally in idle use or rather, low load. The device is still audible with a volume of 35.2 dB(A), remaining with its muffled running noise in the background. Depending on use, the system fan starts-up for a short period and increases the volume somewhat. You can observe how the fan increases its velocity step by step under load, or rather how the responsible ventilator for both graphic cards intervenes after a short time. An average noise level of approx. 44.8 dB(A) could be noted. The maximal observed volume was around 50.3 dB(A). It wasn't as much the noise level but more the frequently often changing rotation speed which makes an existence of the fans obvious. If you measure the surface temperature of the base unit in the area of the keyboard, you might think the notebook wasn't turned on. It averages merely a maximal temperature of 33.8°C and in the area of the wrist support even only 22.5°C. 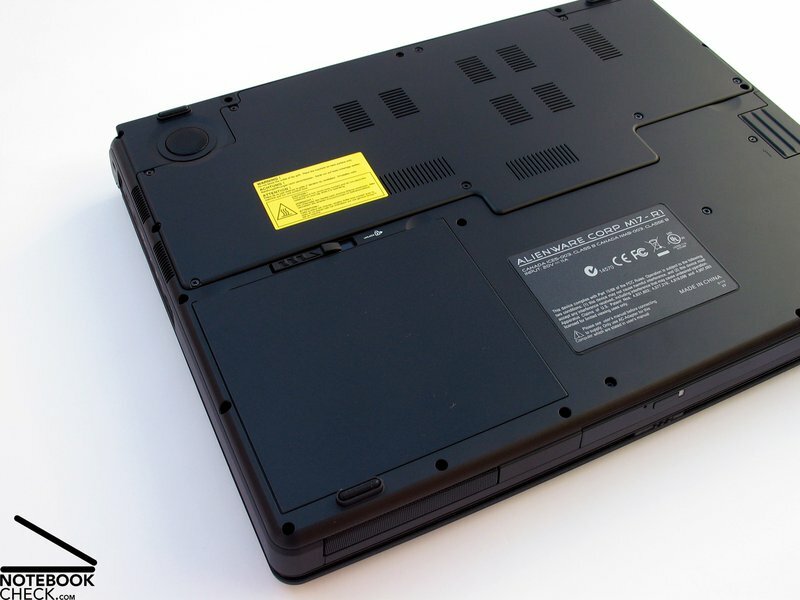 The bottom side reveals the position of the efficient hardware components quickly, these being on the back side of the notebook. A maximal surface heating of 48.0°C was ascertained here. (±) The average temperature of the palmrest area of similar devices was 28.7 °C / 83.7 F (+1.6 °C / 2.9 F). 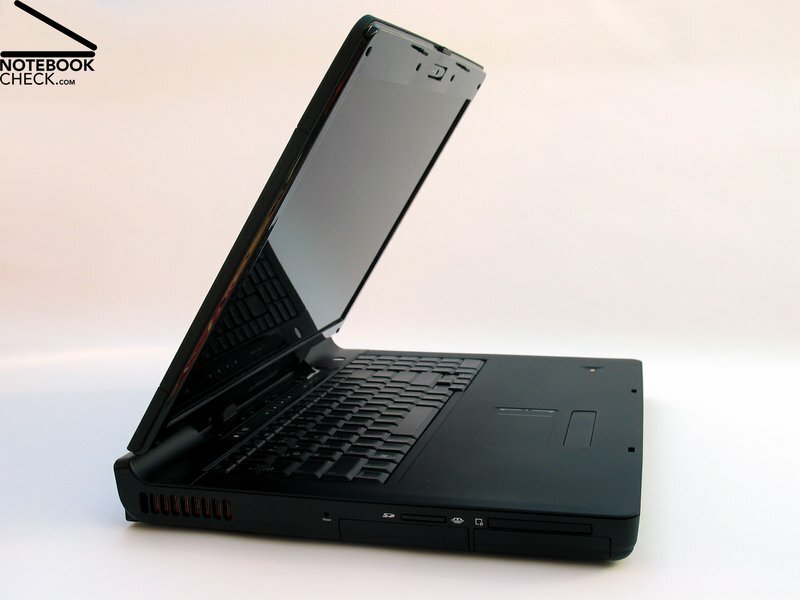 Even though the notebook with an optical-digital port is evidently made primarily for an external sound emission, the built in speakers could very well convince in the test. 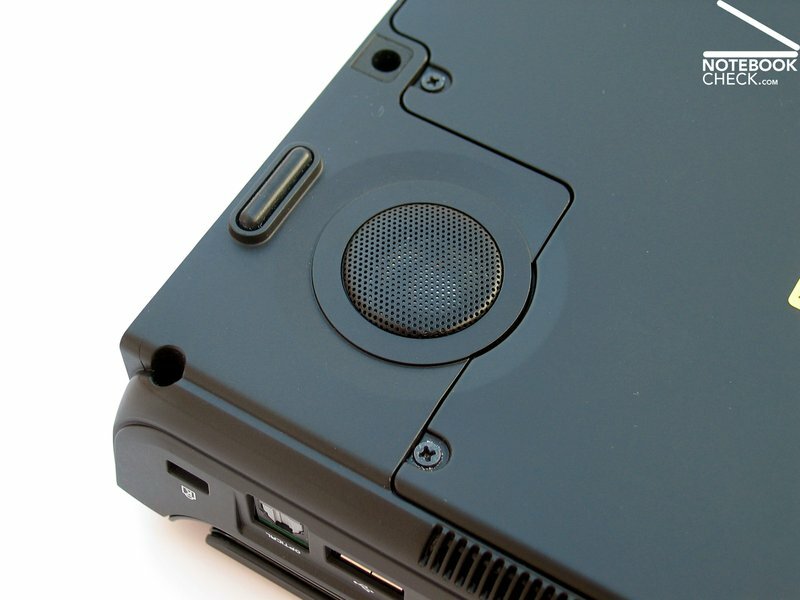 The speakers are found on the front side edge of the device, left and right of the optical drive. 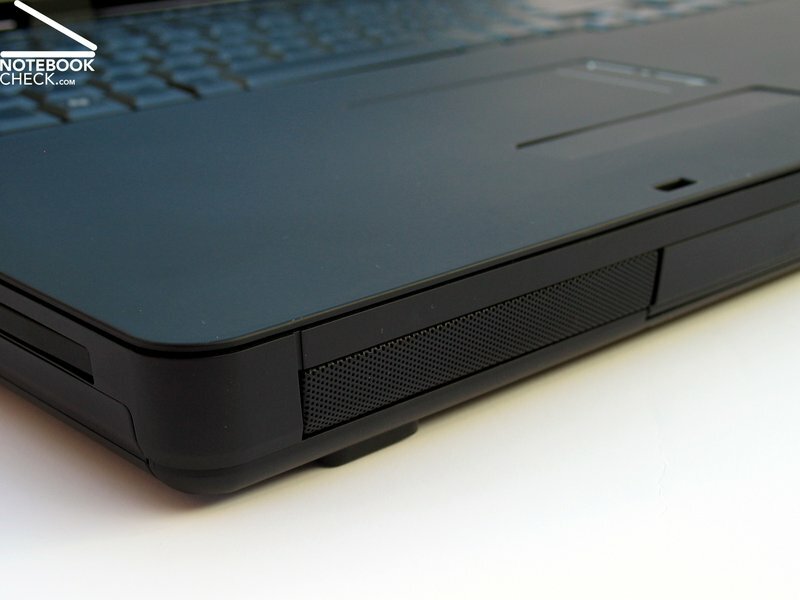 Additionally, the Alienware M17 has an integrated subwoofer on the bottom side of the device. The sound of the integrated sound system can be rated as very good, whereas the offered sound could prevail a bit more. 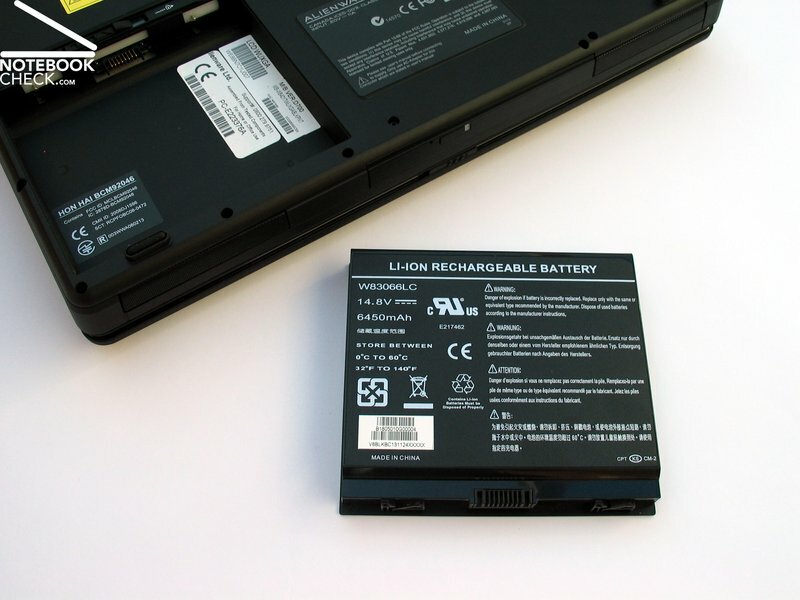 Equipped with a 14.8 V 6450 mAh lithium ion battery (95.5 Wh) the Alienware M17 has a very efficient battery. It's not enough for the very power hungry notebook by far, though. With a power consumption of approx. 50W in idle use and up to 180W under load, the battery achieved a maximum of 107 minutes in the BatteryEater Readers test (min. display brightness, WLAN off, energy savings mode). The BatteryEater Classic test brings you back down to earth, in the end. With a result of merely 42 minutes (max. display brightness, WLAN on, high performance profile, load) it didn't really convince. The practical runtime tests turned out only slightly better. We reached approx. 105 minutes during WLAN surfing, whereas it came to an end already after 100 minutes while playing a DVD. According to our experience, this value decreases considerably due to the significantly higher hardware load during Blu-Ray playing. 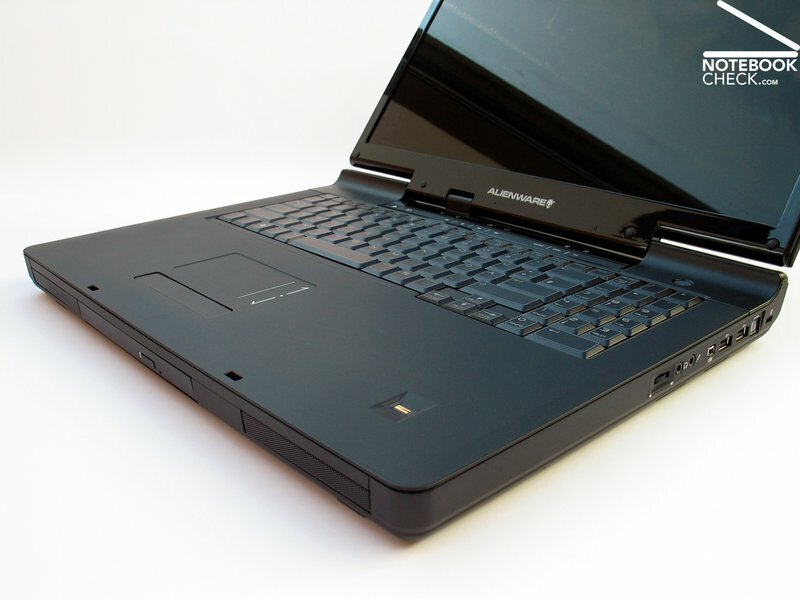 With the M17 Alienware serves now the ATI fan community under the notebook gamers. The device offers efficient mobile hardware which is capable of cracking current games with restrictions, at a price. The case bids a solid basis and a minimum of mobility. With a travel weight of about 6 kilograms, including the power supply, the M17 is still lighter than a desktop based system with the respective display. 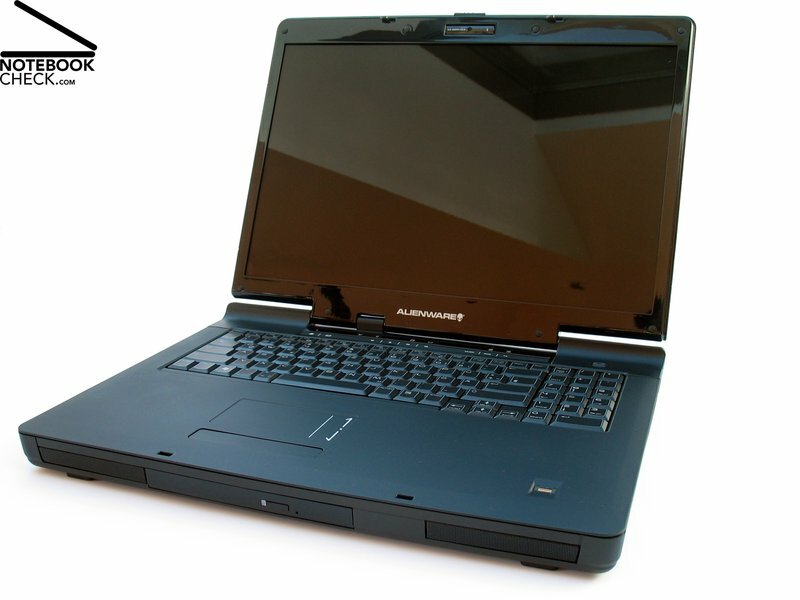 The offered extensive connectivity also reminds more of a desktop device than of a notebook. The display bids a good brightness, shows evident weaknesses in consideration of its illumination, though. The image quality and the maximal image contrast can be rated as stably good. 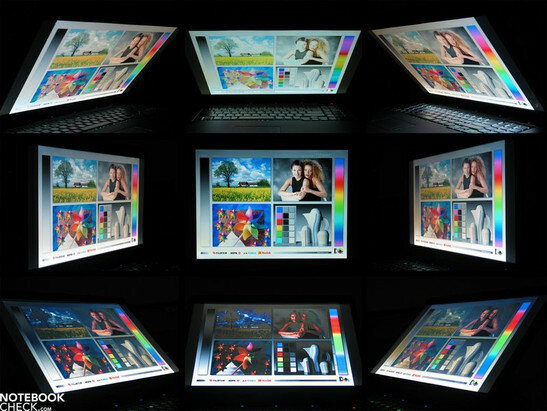 The viewing angle stability of the tested WUXGA screen is acceptable, too. 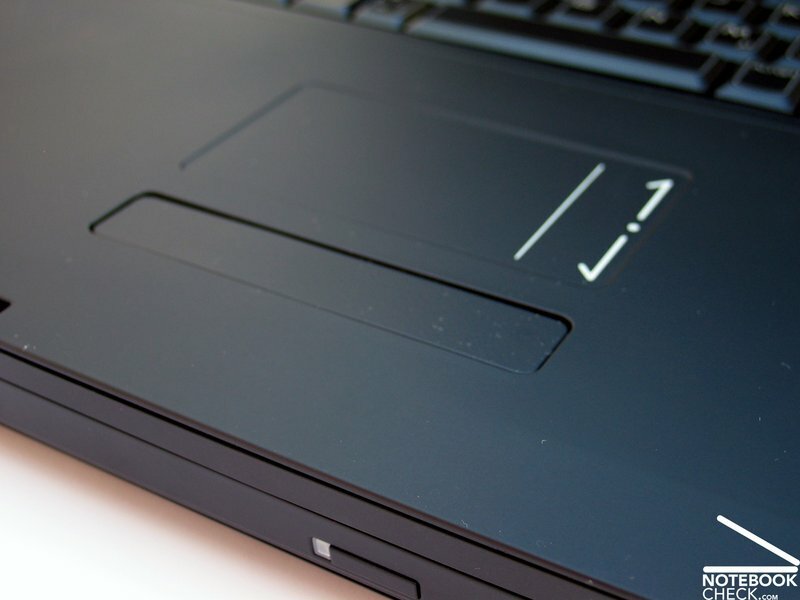 As already hinted, the Alienware M17 scratches at the upper border of possibilities for notebooks with its hardware. It's no wonder then, that it's possible to pick the maximal resolution for most games right away. That this is not possible in every case is shown, for instance, in the test of GTA IV or Crysis which practically couldn't get enough resources. The system noise of the notebook kept itself, without too much load, very much within a limit. The noise emissions of the M17 stayed during a consistent demand of the processor and the graphic card within a decent area of approx. 50 dB(A). The use of headphones is therefore very advisable. The surface temperature of the case always stays very low due to the good cooling. 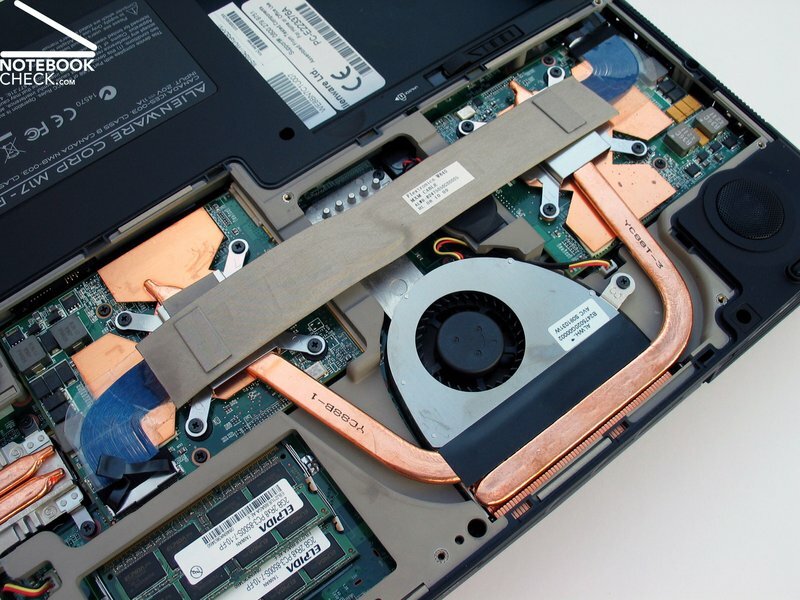 The gaming device outshines most other notebooks with a power consumption of a maximum of up to 180W, but this value is relativized when compared to desktop systems. That is why the battery life of approx. 1.5 hours is not really surprising. In a caliber such as the Alienware M17 this plays an under part anyway, though. The manufacturer specialized in gaming systems, Alienware, launches a new high performance notebook in the DTR category, with the M17. The comparatively high construction of the base unit and the sharp edge on the front, don't contribute to a comfortable typing, either. Because the notebook is primarily thought for gaming, this only plays an under part, though. The touchpad is in this case only an emergency mouse substitution, too. Alienware offers two display variations for the M17: a WXGA+ screen and a high resolution WUXGA display. This delivered a good brightness and contrast but an insufficient illumination in our test. The probably most important configuration feature of the M17 is the offered hardware. 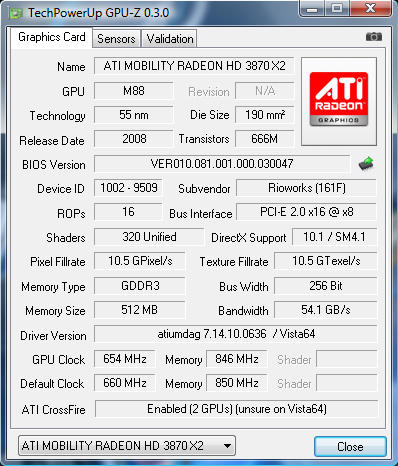 Our test sample came with an applied Intel Core 2 Extreme QX9300 Quad Core CPU which was supported by two ATI Radeon 3870 graphic cards in a crossfire combination. Logical completion: 4GB DDR3 PC3-8500 RAM, with a full support due to Vista 64-bit. Alienware allows for a maximum memory extension of up to one terrabyte, optionally with 5400 or 7200 rpm HDD models, with two hard disk slots. The integrated fans cause a reasonable noise without load. Under load it can get unpleasantly loud, though. 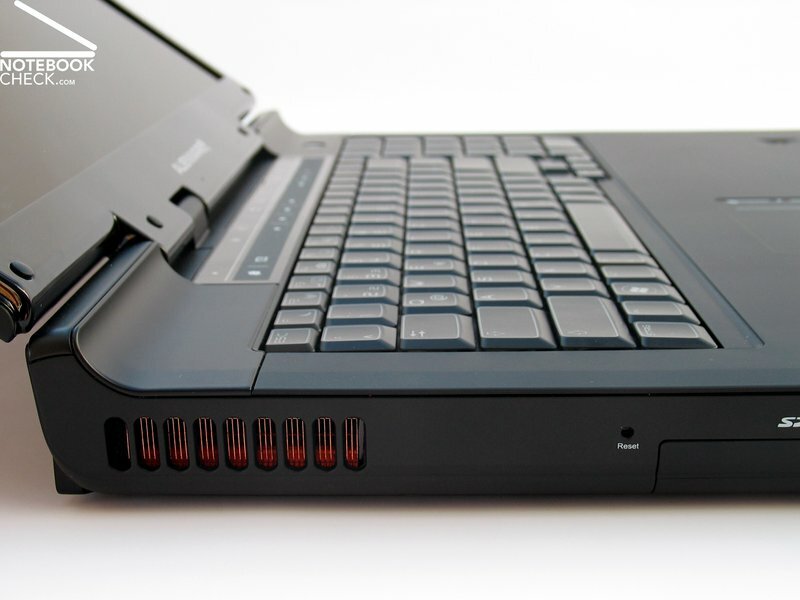 The surface temperature stays within a limit, especially on the upper side of the notebook, for that. ...the built in loudspeakers on the front edge are able to provide for an sufficient soundscape. Particularly the integrated subwoofer on the bottom side of the notebook has a share in this. The keyboard of the M17 is placed very far in the back of the case and doesn't really offer the optimal conditions for extensive text entries. Nothing is left to be desired from the M17 with an HDMI port, eSATA port and an optical TOSlink sound-out. The offered connections are found foremost on the right case side, or on the back side. Beside the m17x it offers high performance, is based on ATI components in consideration of graphics. The case is based on an OCZ barebone, which is also used by other manufacturers. The most important recognition attribute is, besides the alien logo on the display lid, the "Skullcap" design of the screen. ...which has a smooth display lid with a middle light edge and an illuminated alien logo. ...the M17 is till now only available in a plain black tone. Alienware labels this surface finish "Stealth Black", which refers to the velvet-like matt surface. The notebook doesn't only look optically good, the surfaces could also convince in regards to haptics. 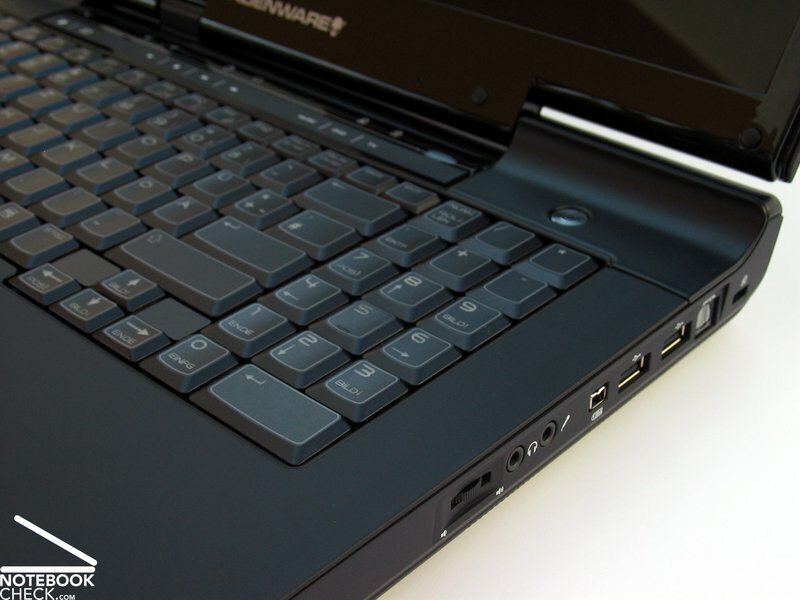 ...the Alienware M17 proves itself as very insensitive for fingerprints and other impurities. The case offers, with the exception of the display, a solid basis in regards to stability. An integrated and pivoting webcam belongs to the equipment of the M17, amongst other things. Alienware offers a gaming bundle with a Logitech G9 laser mouse to a very attractive price. The integrated battery has a considerable capacity but the performance appetite of the M17 can't possibly satisfy it. Alienware's demand to bring in the best values in various benchmark tests. A bit more individuality. The same barebone is in the retail shelf of other manufacturers. How brand new games bring even the most efficient hardware to its knees. Thanks, GTA IV. 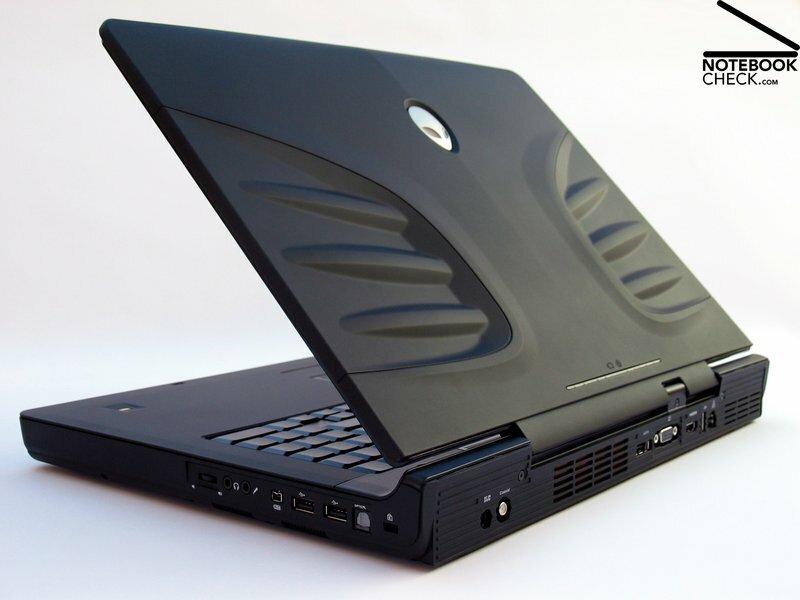 High performance gaming notebooks from all manufacturers: mySN XMG7 / Clevo M570TU, Alienware m17x, Deviltech 9000 DTX / Clevo M860TU, Dell XPS M1730, and the upcoming W90 from Asus.